My 53 year odyssey, thus far, with this fascinating and magnificent art form, began in an other worldly encounter with William C.C. Chen in his New York City school back in 1964. My actual training did not begin then, mainly due to lack of schools and teachers, but six years later in 1970 when a friend and college classmate, Larry Mann, began teaching it in his Norfolk, Virginia, KungFu School. 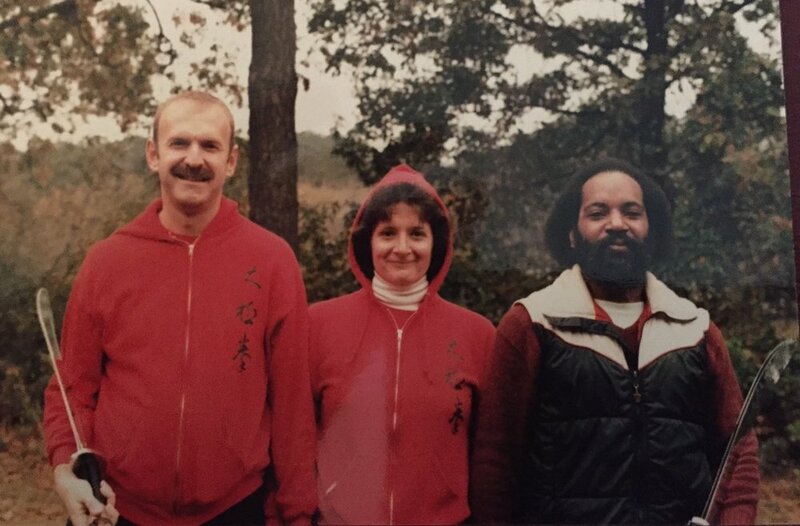 By 1975 when I took my first trip to China, I had joined Larry and classmate Billy Hook in the founding of the Tidewater T'ai Chi Center, and soon after established my own school in Norfolk, the Tidewater T'ai Chi Club. In 1985 I fell into the most magical period of my life when I was able once again to not only journey to China, but to live, work and train there -- a vastly different China than the one I experienced a decade before, and a completely different world than that of today, some three decades later. When I embarked on the 1985 trip, I left the Tidewater Club in the good hands of dedicated senior students who tried their best to keep it functioning during my absence. I was recently given these photos by Kam Hitchcock-Mort, the senior-in-charge, the other two students are Warren Pretlow and Chris Walters. Many of the students in the group portrait joined the class while I was away and are unknown to me. One Lady in particular though, Anita Adams, between Warren and T.T. Liang’s calligraphy on Taijiquan, is healthy and in her 90’s and we are still in contact! In the picture of Warren and Kam with the double broadswords I can tell, with her bowed head and the smile crinkling around Warren’s eyes, that a mistake just took place infeatured the two-person, shuang dao set. I completely lost contact with Chris over the years since returning from Wuhan’s Snake Mountain, but Warren, after graduating from an Oriental Healing School in California, established a thriving, dynamic and successful Taijiquan/Qigong/Acupuncture School in Anchorage, Alaska where I have had the honor of being “visiting pubah” several times. Kam retired from librarian work in California and Texas and lives with her retinue of exotic dogs and cats in coastal Virginia. The three of us reunited finally during my 60th year (Confucius’ milestone, ‘Year of Obedient Ears!’) in both Alaska and Texas (Alaska is the magical land north of the Lower 48, and ya don’t mess with Texas!). In 1989 I transferred what was left in a storage locker of the Tidewater Tai Chi Club to Dr. Jay’s Magic Tortoise Taijiquan School here in the Triangle Area of Central North Carolina. After 26 marvelous years with him and Teacher Kathleen Cusick, I am now at the Black Bamboo Pavilion School, with Violet Anderson in charge, which has become my final Taiji Jia! This shows a merging of cultures! Martial arts, a unity with nature and a bit of yodeling. Last Lesson with Jou Tsung Hwa: GO BACK FUNDAMENTALS! I first met the incomparable Taijiquan teacher Jou Tseng Hwa in 1981, 17 years after first being introduced to Taiji, and last saw him 18 years later, 4 months before his untimely death on August 3, 1998. This post is a short preface to the story of our last lesson on April 5, 1998. LaoMa and DrJay beginning work on MrJou’s dream, building a Tai Chi College. We were digging the corner stone hole to lay the time capsule. I will explain my use of the form of address, ‘MrJou,’ here at the outset just so you’ll understand the inclusion of deep respect and great love it conveys in my usage. MrJou never cared for titles such as Master, Grand Master or any of the misleading alternatives for the Chinese term Shifu (teacher/coach/Master, depending on the Chinese character used). He said on more than one occasion”…if you want, you can call me Master, I have a Master’s Degree in Mathematics!” Mr. (or Xiansheng in Chinese) carries great import, it is not disrespectful to use. Ninety-one year old Ding Hongkui, the greatest teacher I was ever privileged to study and train with was referred to simply as, Ding YeYe --- Grandfather Ding! Students prefer to call their teachers by grand titles, grand teachers that I have had the privilege to study with do not.